With recent events being as they are and no sign of the Review returning anytime soon (though Blair Hodges informs me it will be returning), now seemed like a good time to go back to the beginning. I’m talking about Volume 1. It’s 1989 and I’m only two years old. I live in Colorado Springs, CO. Little do I know that over to the west, in Provo, Utah there was a group of Mormon scholars launching an annual book review that would, in all honesty, change my life. And make no mistake about – the work of “classic FARMS” as it is called, and of Dan Peterson specifically, has changed my life. Now, I’ll grant that without it I would probably still be in the Church. I never had a faith crisis, or anything like that, but the reading of FARMS – and other “Mormon Studies” work which I discovered through FARMS, via the book reviews, or checking the footnotes, etc. – has enriched my faith in important ways; has influenced life decisions (including my resent change in major); and otherwise impacted the course of my life. I want it to be clear – at a time when he is constantly being vilified and blamed for “hurting” others, or leading people out of the Church, or whatever – that Daniel C. Peterson has done some good for me. His witty, yet intelligent, writing style has proven to be both enjoyable and enlightening to read. Anyway…that is enough lionizing. This inaugural issue consists, unsurprisingly, mostly of standard, typical book reviews that offer nothing beyond an assessment of the book under review. There are hints, however, of what the Review would later become, most notably John Clark’s review essay (see below). Reading the Introduction reveals how well Peterson anticipated the future perception of the Review, and seems to preempt the later accusations of meanness and nastiness. All-in-all, there are a total of 18 reviews in this volume. Daniel C. Peterson, “Introduction,” v-x: Peterson’s introduction to this inaugural issue is brief but important. Here Peterson sketches the original intent and aims of the Review, which reading in retrospect seem to have been well maintained over the course of Peterson’s tenure as editor (despite, apparently, some internal politics over the last few years of the Review’s run). Peterson explains that the Review was established to encourage and promote more serious academic study of the Book of Mormon, even outside of Mormon circles; to take seriously the various origin theories then emerging (and that would later emerge) regarding the Book of Mormon); to answer criticisms made against the book; and to ultimately promote the Book of Mormon to the world. Peterson directly acknowledges the unpleasantness, yet necessity, of criticism, noting that it is the nature of reviews to provide constructive criticism. Peterson also stresses that in his view, when there is apparent dishonesty or bad faith (meaning, an agenda against the Book of Mormon, despite attempts to appear neutral), he views this as not only important, but good to point out and identify. This project began with the hope of improving the writing on the Book of Mormon, and I think it has been, by and large, successful. Camille Williams, “Review of Finding Christ in the Book of Mormon, by Susan Easton Black,” pg. 3-4: This is a short 2 page review of a book that has, in the intervening years, become fairly popular. I do not recommend it for its value as a review, though, but for the very brief, albeit valuable, defense of scholarly examination of the book’s historical claims. David P. Wright, “Review of The God-Inspired Language of the Book of Mormon, by Wade Brown,” pg. 10-17: As will be the case in many instances here, the book under review is entirely irrelevant at this point. Wright provides structural analysis of four passages in the Book of Mormon, which may prove useful or insightful when studying those passages. Hence I recommend this article for its analysis of Alma 30: 24-26, 28, 47; and Mosiah 25:8-11. John E. Clark, “A Key for Evaluating Nephite Geographies,” a review of F. Richard Hauck, Deciphering the Geography of the Book of Mormon (Salt Lake City, UT: Deseret Book, 1988), pg. 20-70: The most substantive contribution to the inaugural issue, Daniel C. Peterson has since explained how this review played a vital role in the future development of the Review into more than a venue for brief book reviews. Peterson wanted this periodical to have value in itself, independent of the books under review, and this review made sure that was the case from the very start. Setting out to review Hauk’s geography, Clark decided he first need something to test it against. So, Clark goes through the text of the book, and analyzes key details regarding the spatial and geographic relationships between cities, seas and water sources, wildernesses, etc., coming away with a fairly good map of how Book of Mormon lands were situated (Clark’s reconstruction is slightly different from John Sorenson’s Mormon’s Map, but not substantially). This is then intended to be a “key” for judging proposed Book of Mormon geographies. Clark’s paper is so important that it has since been reprinted in the most recent (last?) issue of the Review. L. Ara Norwood, “Review of Book of Mormon Authorship: A Closer Look, by Vernal Holley,” pg. 80-88: One of the few books under review in this volume that remains relevant today (unfortunately). Norwood actually comes away from Holley’s book impressed, yet unconvinced. Given the quality of anti-Mormon literature of the day (this is still the heyday of Walter Martin, Ed Decker, Jerald and Sandra Tanner, and the like), one can begin to understand why Norwood is impressed. Nonetheless, Norwood points out several flaws with Holley’s argument, and specifically with his proposed map and correlations with New England place names. This is significant, since Holley’s book remains popular among critics today, principally for his map and list of places supposedly known to Joseph Smith. 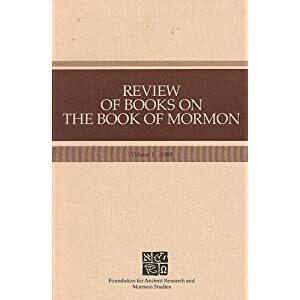 So long as Holley’s book remains a favorite of among critics, Norwood’s review will remain a useful contribution to Book of Mormon apologetics. Louis C. Midgley, “Prophetic Messages or Dogmatic Theology? Commenting on the Book of Mormon: A Review Essay,” pg. 92-113, a review of Joseph Fielding McConkie and Robert L. Millet, Doctrinal Commentary on the Book of Mormon, 4 vols. (Salt Lake City, UT: Bookcraft, 1987-1992), vols. 1-2: At time this review was written, only the first two volumes of this four volume set were available. The four volume set remains popular (I have seen it pulled out frequently and recently by Sunday School teachers), as such Midgley’s comments on them maintain some degree of relevancy. Midgley takes the opportunity to opine on the tendency to treat the Book of Mormon, and LDS scripture more generally, as theological treaties rather than as sacred history with a over arching prophetic message. Midgley stresses the importance of examining the multiple “threads” in the Book of Mormon together (doctrine, history, geography, culture, etc. ), and chides McConkie and Millet for focusing on “doctrine” at the expense of other threads, and for treating the text as if the authors all had the exact same view as modern Mormons. Todd M. Compton, “Review of Lehi in the Deseret/The World of theJaredites/There Were Jaredites; An Approach to the Book of Mormon; Since Cumorah Vols. 5, 6, and 7 in The Collected Works of Hugh Nibley, by Hugh Nibley, pg. 114-118: Compton uses the now popular analogy of Hugh Nibley as the adventurous explorer enthusiastically reporting on new discoveries to describe both the strengths and the weaknesses of Nibley’s scholarship. Later, others would have to examine all his discoveries more closely to determine if it is suitable territory on which to build or if it should be abandoned. Compton then discusses the specific strengths of the volumes under consideration, and the way they have been edited and updated for inclusion in the CWHN. Assessing the overall quality of this issue, in retrospect, is difficult. It hasn’t yet grown into to what it would become, but it is hard not to compare it to later productions. I’d say that for the aims they set out with in the beginning, this is a fairly solid first effort. Most of it, however, has become irrelevant as the books they reviewed have fallen out of circulation. The recommended readings above are the few that might be worth your time, if they discuss issues that are of interest to you. 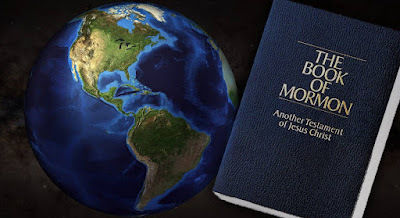 But only Clark’s review is a must read for Book of Mormon geography enthusiasts, and even then that is probably best read in the updated version published in 2011.